The Talking Clever Clock teaches students how to tell time, read digital time, say the time, and solve elapsed time problems. Designed for multiple level skills, this clock features all of the necessary tools for mastering time-telling skills. Children can practice hours of hands-on analog, digital and elapsed time drills. A bonus stopwatch feature lets children demonstrate live action activities. The Say it, self-checking answer button lets children hear their solutions out loud. 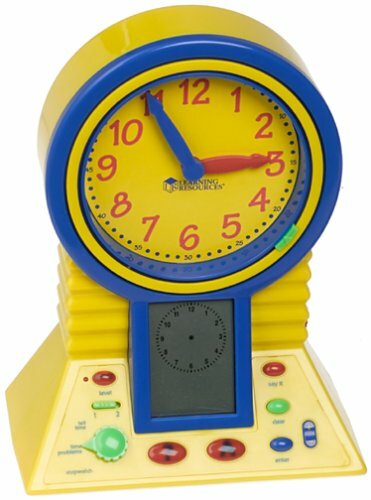 This 10 3/4 clock comes in primary colors and features easy-to-use buttons and large graphics.